The old Westfalen "Bauern Hof" Schulze Schleithoff, in the Family since the 12 th Century, is situated between Münster and Havixbeck, just in front of the Baumberge mountains. Surrounded by great ancient trees, big open lawns and rhododendron bushes the breath taking property is situated amidst the graceful parkland that is Münsterland. It is an idyllic island far away from the outside world- a paradise for children from 7-14 years old- where they can experience an unforgettable riding holiday in the great outdoors. Fun and games after the riding lessons ensures there is never a dull moment. 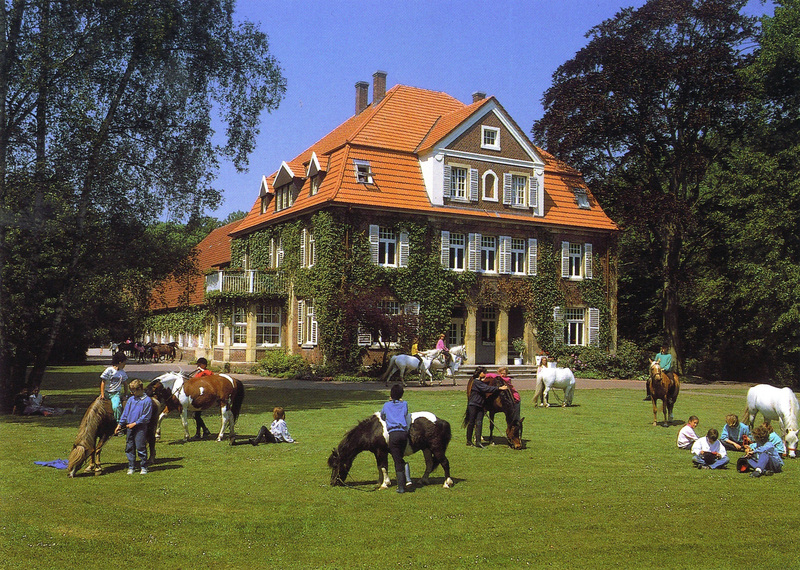 The special thing about the Hof (FN Riding School ****) are the riding ponies. Up to 60 children can spend their holidays learning from our well trained ponies and horses of all sizes. Qualified Riding Instructors offer knowledgeable riding instructions for everyone. A professional basic training in dressage, jumping and cross country riding, up to the German "Reitabzeichen" level, is just as important as fun and joy of the sport. It is also possible to bring your own pony or horse.